Focusing on strengthening the status of women and on cooperation between Jewish and Arab women, the event included a visit to the Na’amat Hashalom daycare center in Jaffa, a bilingual center for Jewish and Arab children, where the envoys were able to see how Jewish, Muslim and Christian children peacefully coexist on a daily basis and learn about the working women’s organization. The foreign dignitaries included representatives from the embassies of Italy, El Salvador, Moldova, Spain, Croatia, Nigeria, Philippines, Nepal, the People’s Republic of Congo and Taiwan. “It is important for us to expose the ambassadors to all aspects of Israeli life, so they can witness the positive areas, and not just focus on the conflict,” said Reut Portugal, assistant to the president of the Ambassadors’ Club of Israel. The group visited the Na’amat Glickman Center for the Prevention and Treatment of Domestic Violence in the Family in Tel Aviv and heard from Vered Swid, director of the Authority for the Advancement of the Status of Women at Prime Minister Office; Nitzan Chen, director of the GPO; Elpida Rouka, chief for regional affairs, Office of the Special Coordinator for the Middle East Peace Process, UNSCO; and Tel Aviv Mayor Ron Huldai. “I like to think of Tel Aviv as the social backbone of Israel,” Huldai said, speaking of the city’s diversity and openness to all sectors of society. 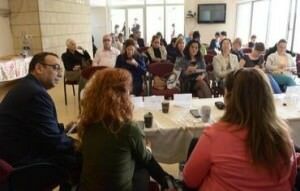 He praised Na’amat and the work being done at the Center for the Prevention and Treatment of Domestic Violence, saying it was crucial to advancing and caring for women’s rights in Tel Aviv, regardless of race, religion or socioeconomic standing. The center operates a closed shelter for battered women and their children as well as an open section, which offers counseling, legal advice and seminars for battered women, children and battering men. Shirli Shavit, director of the International Department at Na’amat, explained that the open section sees walk-ins from all levels of society, whereas the shelter receives mostly poor Jewish and Arab women who have nowhere to turn. During the tour, a young boy living in the shelter with his mother and two sisters ran up to Shavit and hugged her leg. She said that the first time she met the boy he ran to his room and wanted to show her his blanket. She went with him to his room and saw a very ordinary blanket. His mother, who was pregnant at the time and later gave birth to the first girl born at the shelter, explained to her that this was the only possession he could take when they ran away from home. “He could not bring any toys, only the clothes he was wearing and this blanket, which he has had with him since he was a baby,” Shavit said. The day concluded with a panel discussion on women’s issues in Israel, focusing on the progress made toward the advancement of women and what could be done to improve women’s equality in all areas of life.